Left: All of the port of call the Wilhelm Gustloff made during her time as Lazarettschiff 'D'. (Not including Rendsburg, Schleswig-Holstein). ​​​Right:Wilhelm Gustloff as Lazarettschiff D. Source: Cover, JSC's 1:400 Wilhelm Gustloff hardstock model kit. Treated 3,151 sick and injured. 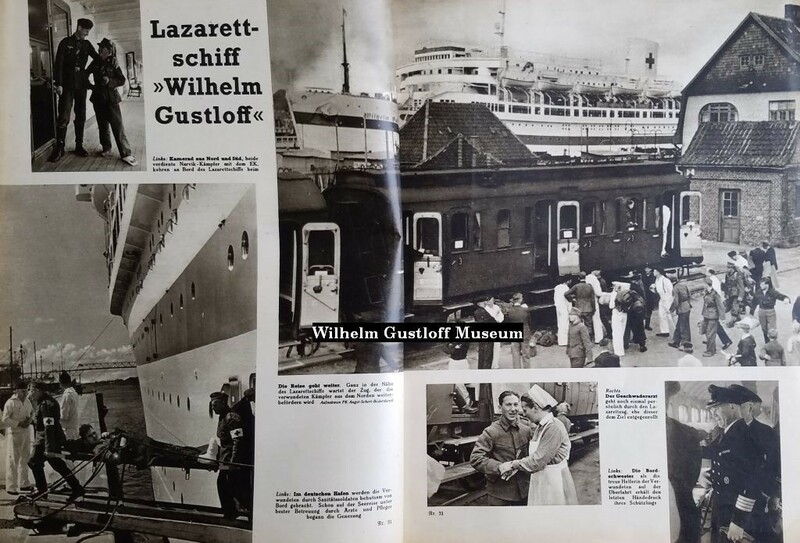 ​​ Possibly the last artlcie published during the Gustloff's stint as hospital ship Lazarettschiff D.In this publication (translated as The New Line), there is over a 2 page spread. Published in October, 1940, the Gustloff only had days left as a hospital ship by the time this was released. 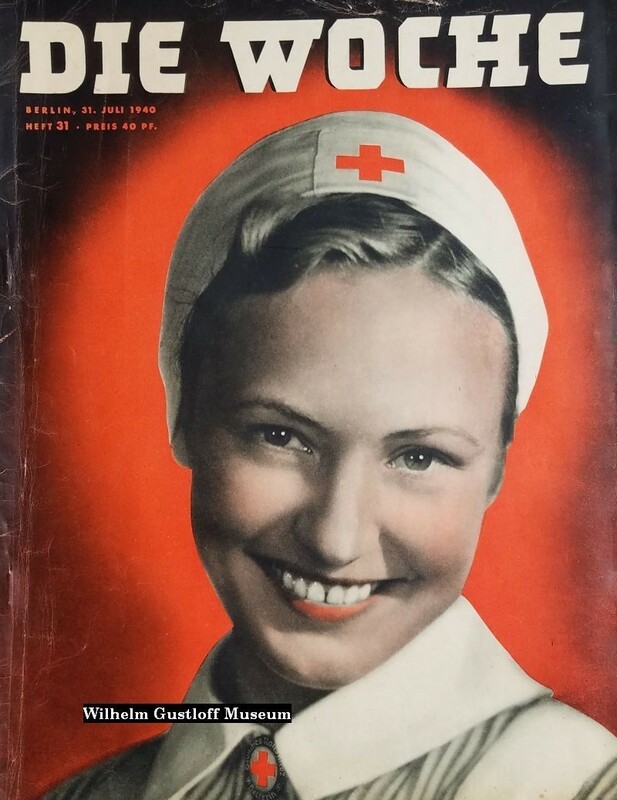 ​Die Neue Linie was primarily a fashion and style magazine - somewhat of an odd place for a story on a hospital ship! However, intrigue over the former cruise ship's role in the war obviously held some value to the publishers. The inevitable brush of propaganda displays life as carefree and even relaxing on board. It was just a few days prior on August 25th when the Wilhelm Gustloff docked in Hamburg after her 50th voyage to Norway. By this point, the Gustloff had completed 60 voyages in all and sailed with 80,000 passengers around Europe. Those on board imagined once they disembarked the great passenger liner, her crew would ready her for another trip up to the Norwegian Fjords. Some passengers probably would've been discussing what was planned to be the Wilhelm Gustloff's longest voyage ever, traveling to Japan for the 1940 Olympics. Surely that would be a voyage worth taking on one of the two flagships of the Kraft durch Freude fleet. Captain Bertram knew otherwise. Earlier, he had read a coded message in envelope "QWA 7" informing him to take the Wilhelm Gustloff back to Hamburg and await further instructions. Due to Hitler's ambitions, all of the ships in the German fleet were called back to port never to complete another passenger voyage again. Since its inception, the Kraft durch Freude program had a total of 79,160,781 participants by the end of August 1939. His rise to power in 1933 eventually gave him the means to begin taking back those Germanic lands that the Treaty of Versailles in World War I took from them. It began in March, 1938 in Austria (Österreich). Known as the Anschluss, The Third Reich annexed Austria with a plebiscite to which the Wilhelm Gustloff participated on April 10th, 1938. This was during her voyage to the Tilbury Docks in London for Germans living abroad to vote. The vote in reality did not matter. Even though there was a 99.7% vote for the annexation, there was coercion at the polling stations and those who would have voted against it were largely not allowed to vote. By this time, Germany had already marched into Austria to occupy it as well. Then in October, Hitler set his eye upon the Sudetenland or Czechoslovakia. Advocating for ethnic Germans in the area to reenter the Third Reich, it sparked the Sudeten Crisis and threatened war. This was solved with the Munich Agreement which avoided war, but still annexed Czechoslovakia. As the Wilhelm Gustloff sat in Hamburg, there was discussion among the locals revolving around the usual activity of the ocean liners now in the harbor. Hitler originally planned to invade Poland on August 26th, but this was delayed due to discussions involving Britain and Poland. September 1st, 1939. Hitler resumes his plans to add Poland to the Third Reich through invasion and Britain with France declare war. World War II had begun and almost immediately the ships at anchor were requisitioned into the Kriegsmarine for the war effort. 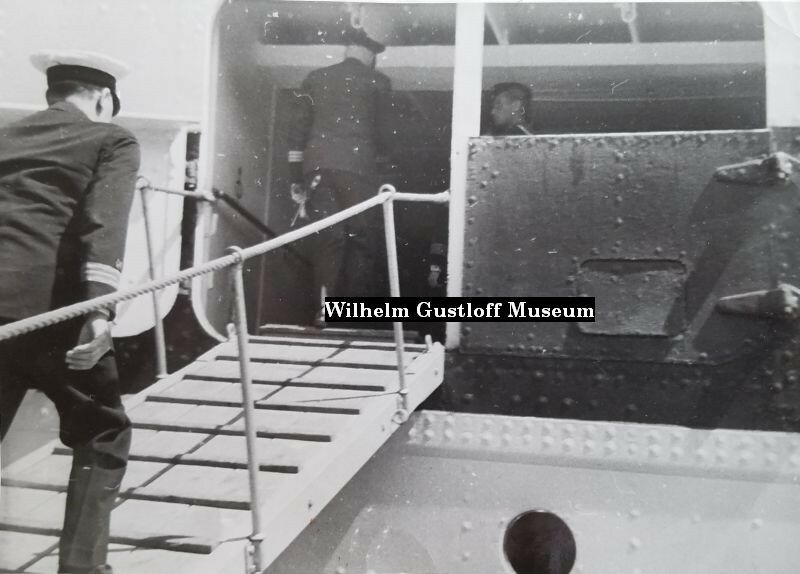 The following day on September 2nd, 417 of the Wilhelm Gustloff's crew are released leaving a skeleton crew, the senior crew, and Captain Bertram aboard. 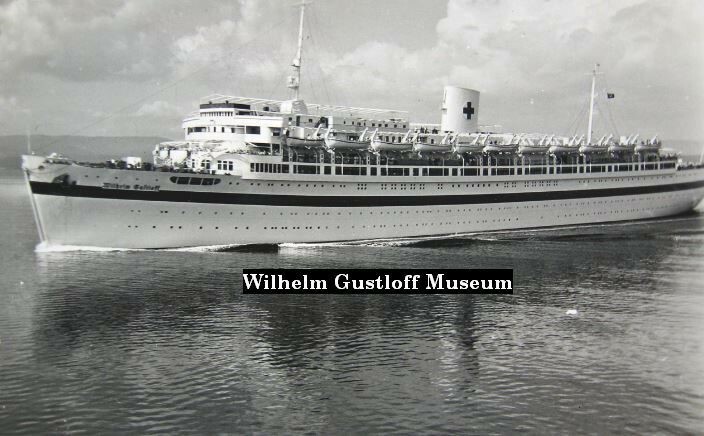 As the conflict progresses, September 9th brings news that the Wilhelm Gustloff will be designated as a hospital ship. The Berlin will become LAzarettschiff 'A', the Gustloff's sister ship - the Robert Ley - will become Lazarettschiff 'B', the Stuttgart will be Lazarettschiff 'C' and the Wilhelm Gustloff will become Lazarettschiff 'D'. On September 22nd, she becomes an official part of the hospital ship fleet and is converted. Her interior furnishings are put aside and medical equipment soon takes the place of her tables and chairs. Open dance floors are now lined with beds for the sick and wounded. Doctors and nurses from the German Red Cross, or DRK, fill cabins where excited passengers once sat before their cruise around Europe. It is unknown if all of her furnishings were stored on board, or placed at an off-site warehouse. ​On her exterior, had to conform to international law regarding identification of hospital ships. The Gustloff receives a green stripe along both sides of her hull along B Deck. 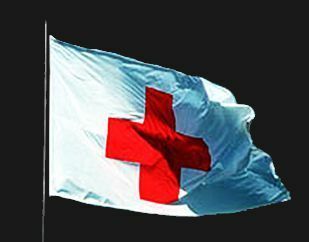 Her KdF logo that emblazoned her funnel was painted over with a large red cross. A large white tarp with a red cross was also mounted to her Sun Deck just beyond the funnel. There was also a white pole attached on the front of her bow which served as her paravane minesweeping system, with the paravanes, or underwater gliders, attached on the upper deck of the bow. 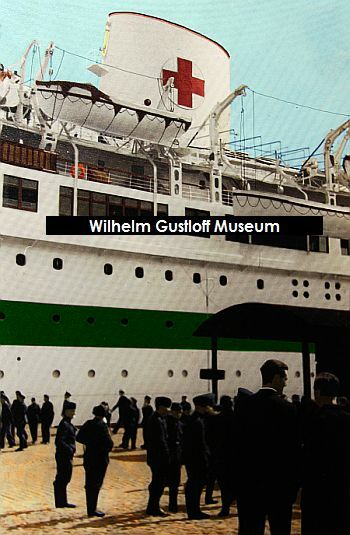 The Wilhelm Gustloff receives her red cross and the stripe is halfway finished around her hull. 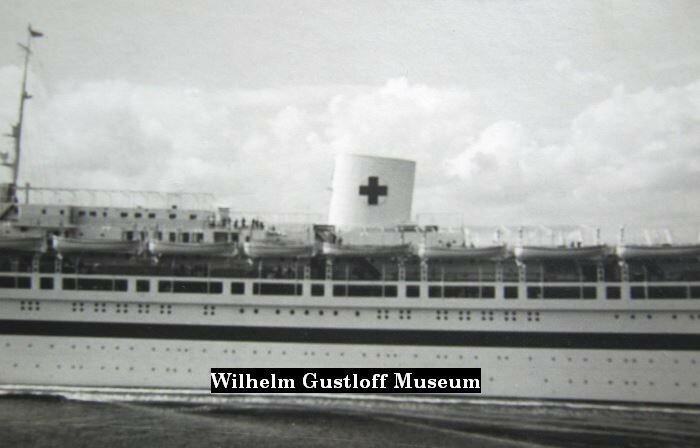 The Wilhelm Gustloff sets sail with her finished hospital livery in September, 1939. On September 22nd, 1939, the Wilhelm Gustloff is fully converted and heads towards the Baltic Sea. Her first destination is to head to the port of Danzig-Neufahrwasser in Poland. The latter also called Nowy Port, is a location on the Westerplatte peninsula in present day Gdansk. Surprisingly, the first wounded treated on board are not those of the German Wehrmacht. After she ties up, the Gustloff takes 650 wounded Polish soldiers from the fighting in the area. The first Germans that are brought for treatment are 10 crew members from the minesweeper M-85 after she struck a mine and sank on October 1st. The Gustloff does participate in an addition voyage along the Lithuanian ports to take Baltic Germans to be rehoused in the west on November 5th, 1939. She docks again in Danzig on November 15th where she will remain for the next few months. In April of 1940, she was moved to Gotenhafen to prepare to lend a hand in Expedition Weserübung - the occupation of Norway and Denmark by Special German Armed Forces. Photo No. 3 shows her paravane minesweeping pole clearly. Lazarettschiff 'D' letter. Sent on September 24th, 1939 via Danzig. Sent from the ship to Ms. Charlotte Pfeifferfrom her husband Dr. Pfeiffer. ​"Do you think the war will come to an end? 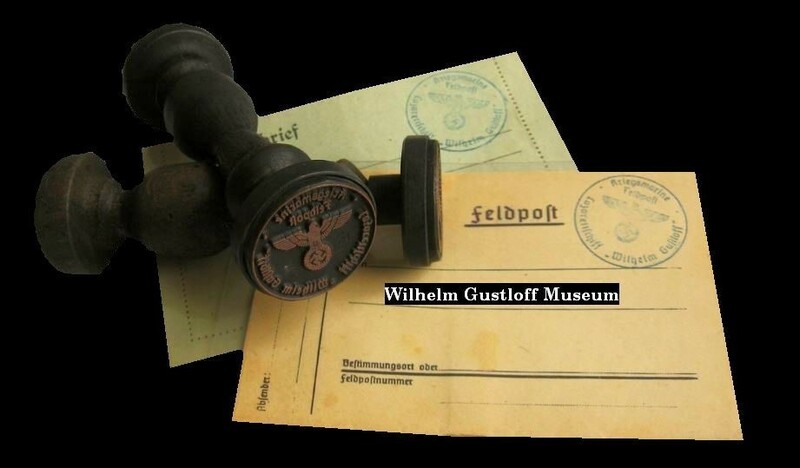 Presented above are two postal stampers which were used on board the Wilhelm Gustloff when she was Lazarettschiff 'D'. 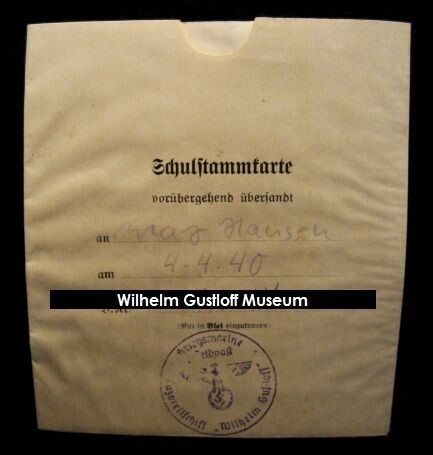 The bottom of the stamper reads "Kriegsmarine Feldpost, Lazarettschiff 'Wilhelm Gustloff'". The makers mark remains on one of the two and the handle is engraved "Manuf Willy Pudert. Schles Stemp. Gorlitz * Mittelstr.8." With them are feldpost letters and postcards with this marking. I have heard around online that these could be reproductions from Poland, but I am not completely sure. They certainly seem original to me. 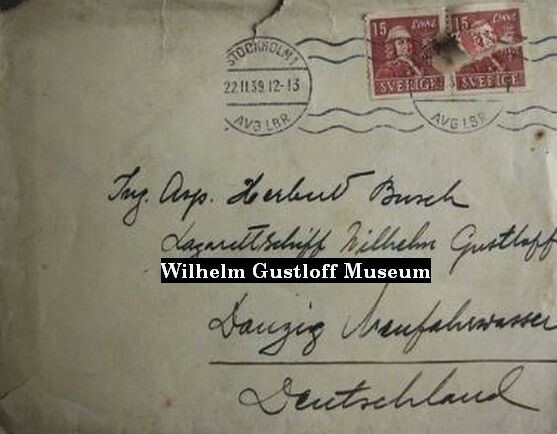 Another envelope addressed to Herbert Busch on the Lazarettschiff Wilhelm Gustloff.​ The letter inside is missing, back stamped that it was checked by the Wehrmacht command. 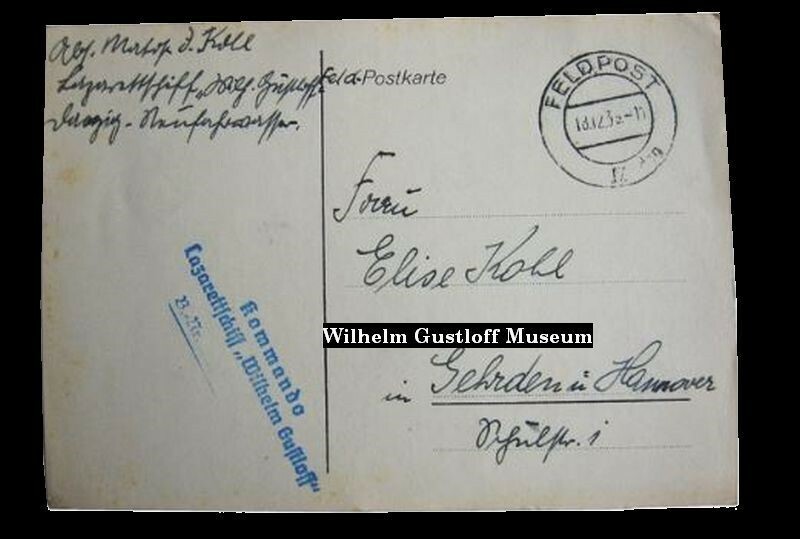 Postcard cover written by Seaman J. Kohl from on board the Wilhelm Gustloff on December 13th, 1939 to his wife Elise. 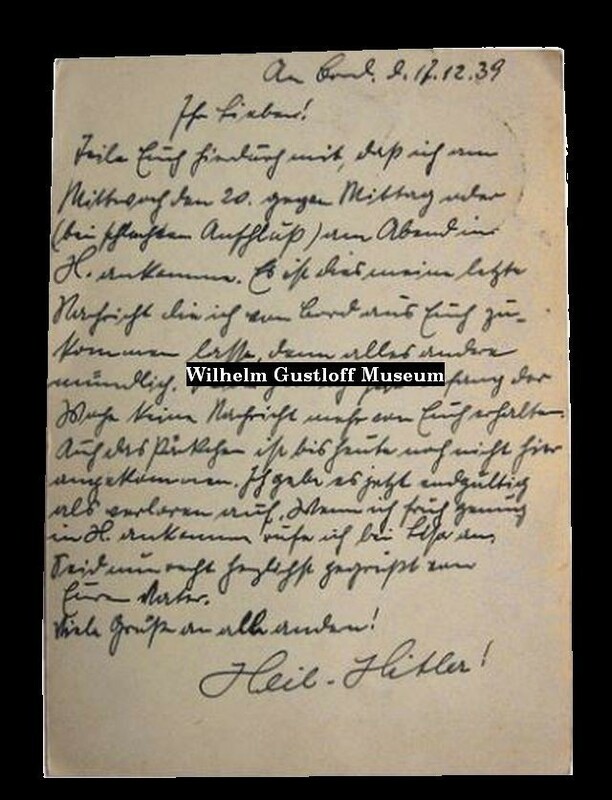 Back of the postcard signed off with Heil Hitler. 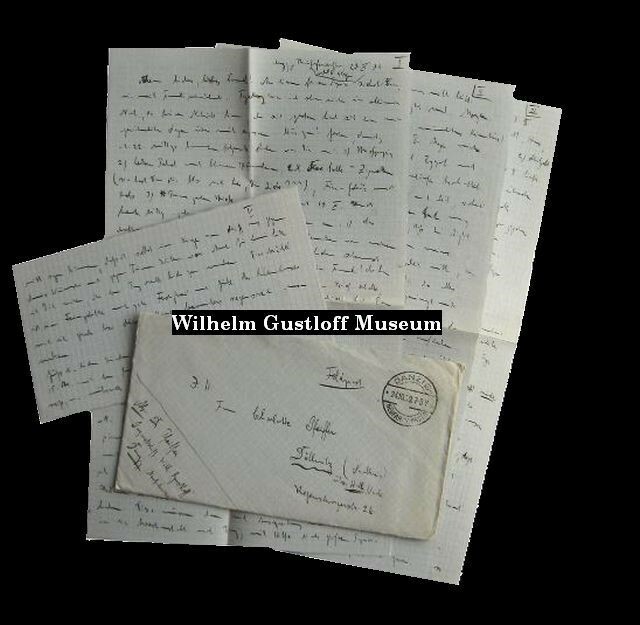 He writes that he is coming home to Hamburg by train around noon, or in the evening depending on the connections; he complains that the mailservice lost a package and that the mail is slow. 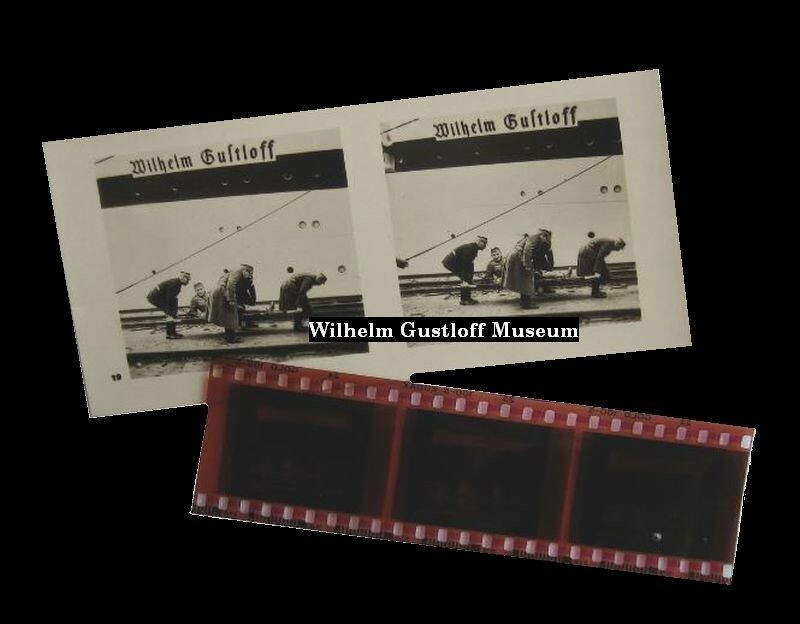 Stereoscope (3D) images of the Wilhelm Gustloff as a hospital ship. 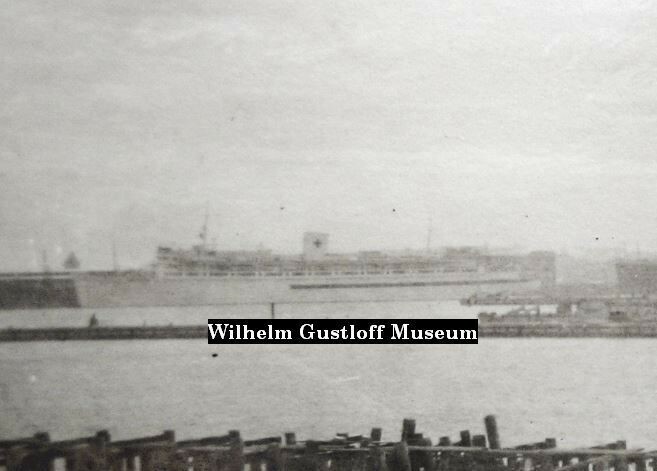 During the winter months, the Wilhelm Gustloff was positioned on the opposite side of the pier. Surrounded by ice on all sides, the photos give a clear view of the steel rung ladder that was also attached to her bow to reach the cables attached to the bow pole. As an uneventful winter turned into spring, the Gustloff was positioned back on the other side of the pier. Eventually, her sister ship the E.S. Robert Ley joins her for a short time. This is the last time the two ships would be near each other. I have seen where some of these photos may have also been taken in Gotenhafen during this time, such as photo number 6 below. 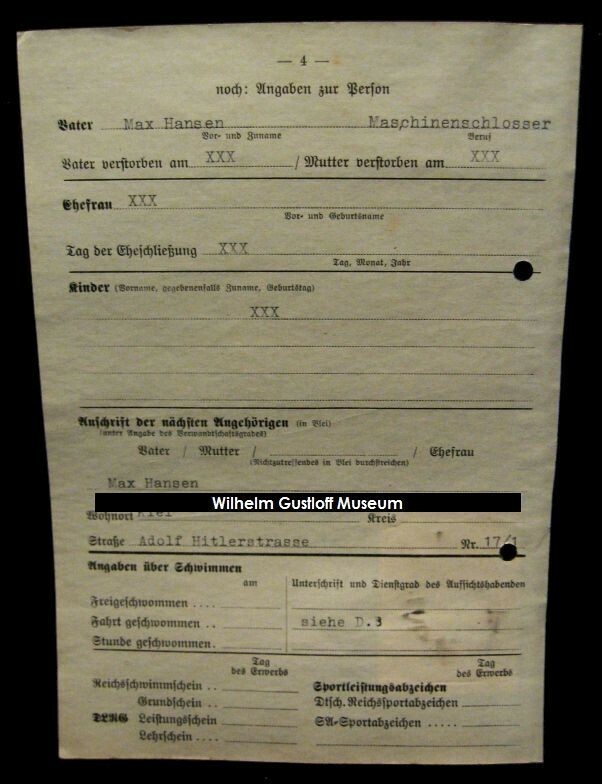 ​ Information sheet of German Navy soldier Max Hansen. 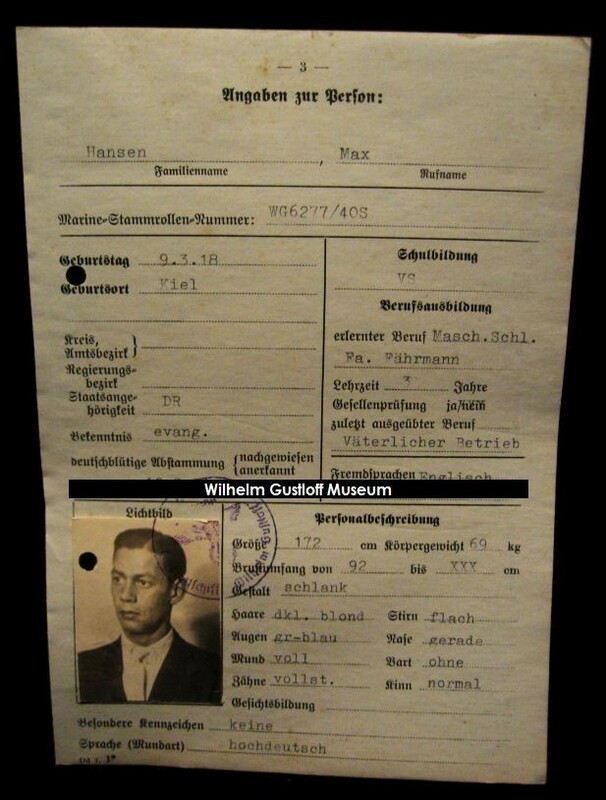 On the sheet is his name, his data, his occupation (machine fitter), English language spoken, his height, weight and the personal description such as dark blond hairs, grey green eyes, flat forehead, teeth are complete, normal chin, no special marks and that his slang is high German. 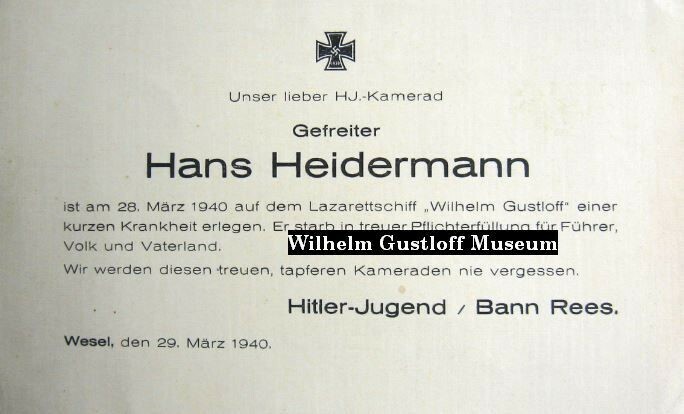 His photo was over stamped with the Wilhelm Gustloff stamp. On the reverse is the name of his father and the note that Navy soldier Max Hansen is not married and has no children. His father lived in Kiel at Adolf Hitler Street 17/1. 2. Master card or staff card bag/envelope with following handwritten entry: "Max Hansen on 4.4.40, B no. 1.00/7c. 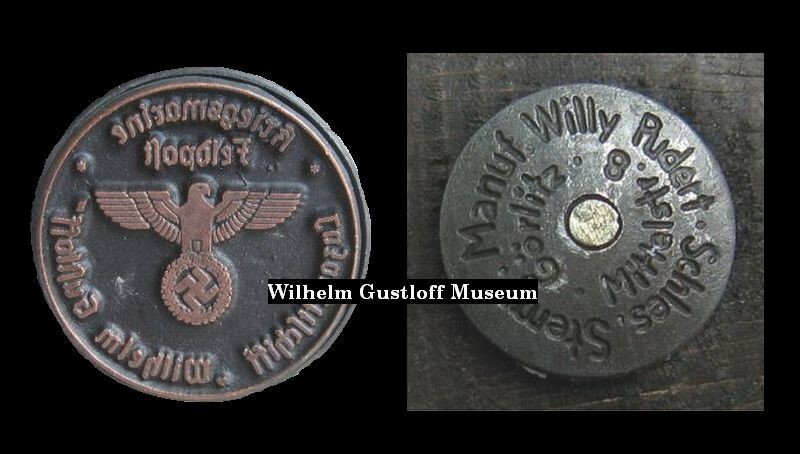 Stamped by the Wilhelm Gustloff. ​Wir werden diesen treuen, tapferen Kameraden nie vergessen. 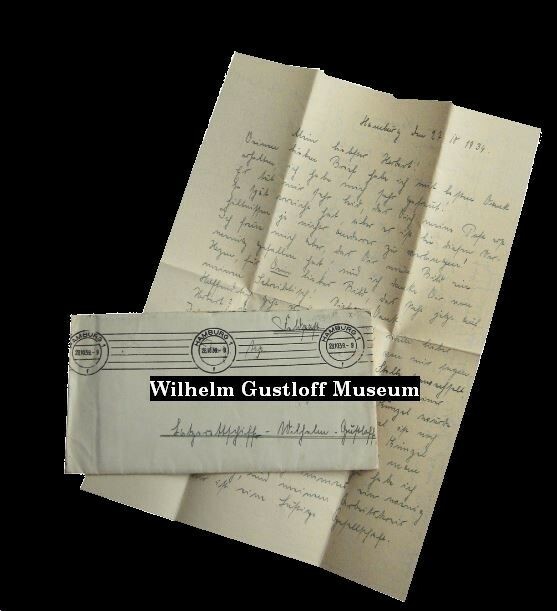 ​has died on March 28,1940 on the hospital ship "Wilhelm Gustloff" after a brief illness. ​He died in faithful performance of duty for leaders, people and our country. ​We will never forget these loyal, brave comrades. ​Hitler Youth / Bann Rees. Another touch of irony occurs as the Lazarettschiff 'D' is finally ordered out of Danzig by way of Sassnitz and returns to the North Sea for the first time since pleasure cruising. During peacetime, the ship had never been allowed to dock at a Norwegian port. With the country now a warzone, the Gustloff ties down in Oslo, Norway on May 10th, 1940. Her orders were to remain there for roughly 3 weeks to assist with those injured and wounded in the town of Narvik where British troops were landing due to it being a strategically important location. She ended up remaining there for almost two months. Officially, Norway surrenders on June 10th. KdF Schiff "Wilhelm Gustloff" unter dem Roten Kreuz. 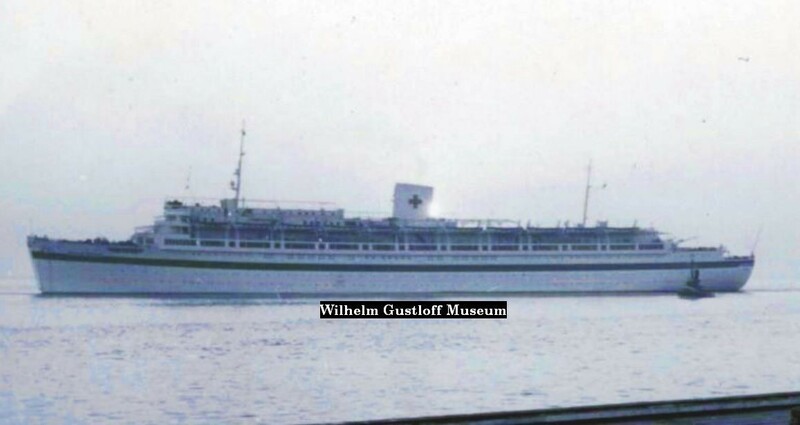 or The KdF Ship "Wilhelm Gustloff" under the Red Cross. Those happier people who sailed on her in recent years for happy holiday seasons were proud of the KdF fleet visiting foreign countries. They would have never thought that these ships would serve for purposes other than those for which they were intended, namely, taking German workers to show them the beauty of the world and force them to give in to carefree weeks of recovery for new relaxing. Written on the back of these two photos is a simple date: July 2nd, 1940. ​​Once the Wilhelm Gustloff was finished with her mission, she was reassigned again. She left Oslo bound for Kiel on July 2nd, 1940 with 750 wounded on board. ​​Someone on a passing ship caught her departure in two photographs from that day. This set of photographs shows the Wilhelm Gustloff briefly in Kiel for the unloading of wounded before she was set to depart. Included are 9 photos of unknown officers aboard while in port. Lazarettschiff 'D' was set to return to Oslo, but received orders for Stettin. After her next stop in Swinemünde, the Wilhelm Gustloff sails down the Stettin Lagoon and Oder River into Stettin on July 10th. This time, she anchors more as a tourist attraction than a hospital ship. News of her arrival has many of the locals arriving at the waterfront to see the beautiful white passenger liner. While at anchor, she is waiting to hear about her role in Operation Sealion. This was the codename for the invasion of the United Kingdom by the Third Reich in 1940. 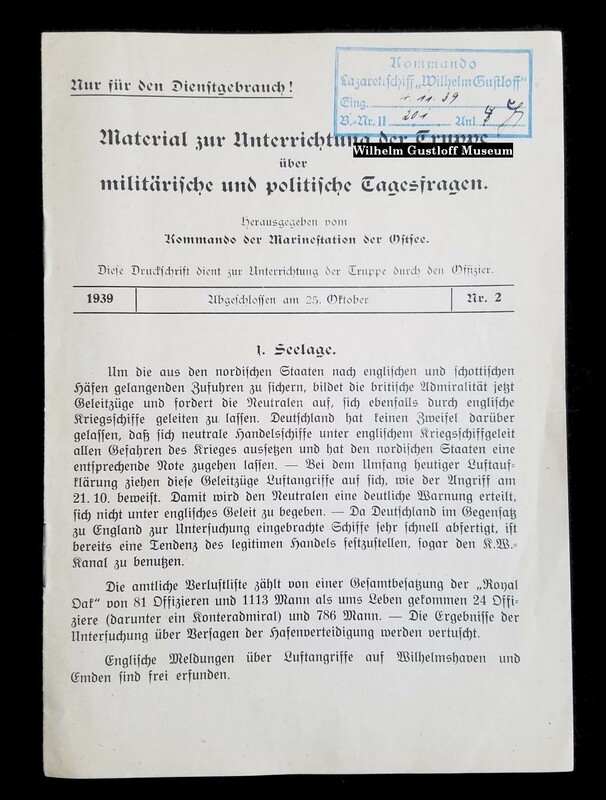 ​On July 16th, 1940 Hitler issued his Führer Directive No. 16, which set in motion the plans for the invasion. In order to carryout the plan to take over the UK, the Luftwaffe needed to achieve air superiority and the Kriegsmarine needed to obtain control over the English Channel. As July turned into August, Hitler ordered the Luftwaffe and Kriegsmarine to increase their pressure to control both land and sea, but it was a battle that they could not win. The invasion was set to take place on September 15th, but as Hitler met with Hermann Göring, it was quickly becoming clear that the efforts by the Royal Air Force and Royal Navy would not allow a landing to occur. On September 17th, Operation Sealion was canceled and the Wilhelm Gustloff would not have to play a role. No doubt, it would have been the bloodiest conflict that the liner would have participated in as a hospital ship. Instead, Stettin turned out to be her most peaceful. By August 25th, she was ready for her next assignment. 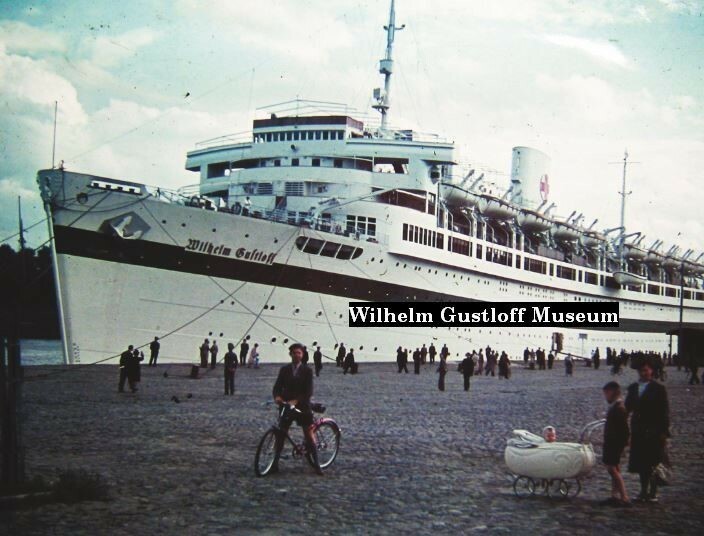 After Operation Sealion is postponed indefinitely, the Wilhelm Gustloff weights anchor and heads to Bremerhaven. Once she departs Stettin, she makes for Kiel where her mine protection equipment would be repaired after being ruled defective. Whether this was her paravane minesweeping system on the bow or the thin anti-magnetic cables strung up between A and B Decks is not known. (There is a very clear photo of the second on the next page when Admiral Donitz visits in March of 1943. According to at least one photo in the Gustloff Archive, the ship sails further inland from Kiel to unload more wounded German soldiers from Danzig . This time, the liner ties up in Rendsburg, Schleswig-Holstein. The dates are not listed, but I presume it is during this voyage. ​ After she left Kiel, she headed around Denmark for Bremerhaven (Wesermünde), Germany. Once in Bremerhaven, it was rumored that she was going to be sent to Rotterdam in the Netherlands. The city was bombed and leveled 4 months earlier and the Netherlands were now under Nazi control, though it is unclear what role she would have played. The Gustloff remained in Bremerhaven for nearly two months, but I have yet to see any photographs documenting her time there. 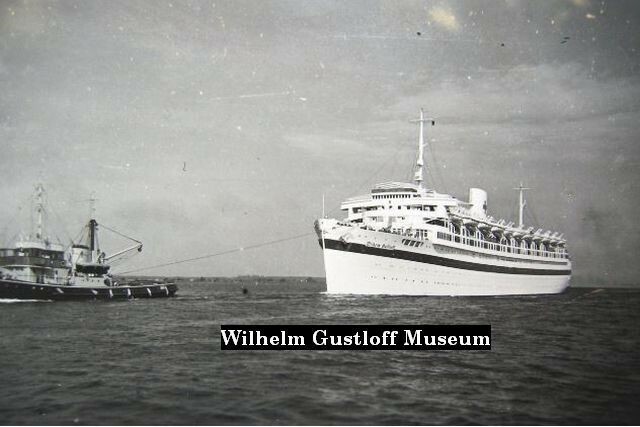 Left: The Wilhelm Gustloff is under tow as Lazarettschiff 'D'. With Operation Sealion cancelled, the demand for floating hospitals and transportation diminishes significantly. 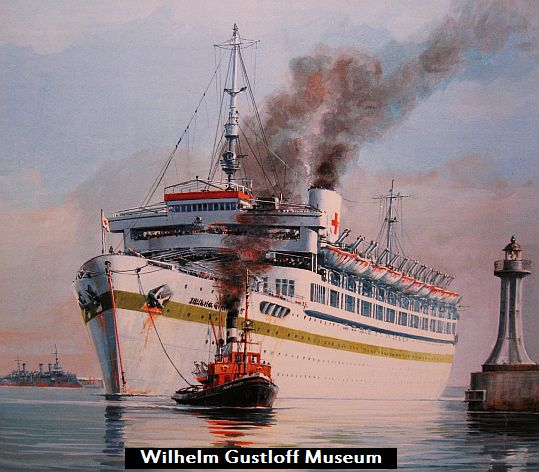 On October 22nd, it was realized that the Wilhelm Gustloff would not be sailing to Rotterdam, she was ordered to return to Oslo one last time and pick up an additional 414 wounded from the fighting there. She arrives in Oslo around the first of November and only stays briefly. Once the wounded are loaded onto the ship, she sets sail to Swinemünde where she will dock by November 12th and unload the injured servicemen. Below is a series of photographs from her voyage from Oslo to Swinemünde which are dated November 1st and 2nd, 1940. 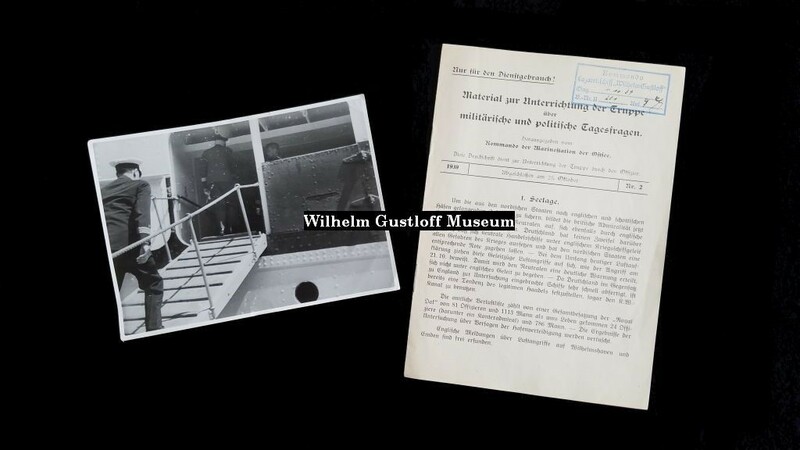 Below & Right: A photograph of officers boarding the Wilhelm Gustloff as Lazarettschiff 'D' in 1939 and a naval document with a "Command - Hospital Ship Wilhelm Gustloff" stamp: Only for official use! Leaflet: Matters to inform the troops about military and political issues of the day. Published by the Naval Station of the Baltic Sea. Die Woche - or The Week. Featuring a two page spread on the Wilhelm Gustloff as Lazarettschiff 'D' through a series of photographs from when she was in Oslo, Norway. ​High up the sea spray splashes against the white walls of the ship. The Wilhelm Gustloff moves quietly and evenly. On the Sun Deck it is unlikely to be quiet, and even on the sheltered Promenade Deck one searches in vain for the happy, sun-browned faces of the workers from all parts of the empire, whom the KdF steamer carried across the sea in a happy distance. The sign of the "Strength through Joy" program on the chimney is lit up by another sign that means help, healing and salvation - the red cross on a white background. The steamer has become the hospital ship of the German navy and now has to fulfill quite large tasks. How is it possible at all to turn a steamship into a floating hospital? Amazed we enter the large halls, in which even recently festive events of the Wilhelm Gustloff have become exemplary hospitals, as we can not expect them to be better and better in any large home hospital. Fifty to one hundred and fifty wounded lie comfortably in comfortable beds and have none of the care that is given to their land-mates. Not even the fresh flowers are missing on the bedside table, and if the portholes were not behind us to which the sea sings its ancient song, we could never believe we were in a floating hospital. ​ But our soldiers are also in many individual cabins, and the sisters of the German Red Cross scurry tirelessly along the ship's aisles to treat each and every one of their patients with the same care and devotion. In the operations and X-ray rooms, every precaution has been taken to be able to enter in a timely and sustainable manner, even in the most severe cases. Our sanitary facilities have always evoked the admiration of foreign countries. And yet the care on a hospital ship differs substantially from that of the mainland, however, neither in the way of treatment nor the care, just by all the advantages and disadvantages of a ship. "Look," says Sister Lotte, and laughs at her problem child in the face, which is getting rounder day by day, "what our Steiermärker (native of Styria, Austria) as worried me about, his mountains and wind force eight are two fundamentally different things, and first we had to deal with the seasickness before the wounds healed. " - "Quite so, my napping took a hit," says the Styrian, "but I am quite strong in my opinion of the healing see air." And sister Lotte nods affirmatively. Many of their caregivers have just recovered brilliantly from involuntary seafaring. They are already walking on deck, their faces relaxed, their eyes clear and happy. There, in the corner, one has the accordion on hand, and soon singing comes from rough men's throats over deck: We fly against England's land and with us death flies! ​What a right sailor is, anyway, feels at home on these fluctuating boards. The landlubbers, of course, need distraction and distraction when they are on the way of discovery. And then the sisters re-invent something new again and again. Even skat (card game), can be played when it shortens hours for their patients. The home port is still far away, but again and again there is something new and exciting, comforting and safe for the wounded. For each one, the nurse knows the advice. Almost unnoticed, she made her way from the hard fight of the front to the peace of his homeland. That is the essence of the community of the floating hospital: in the narrow space of the ship, the camaraderie grows among all those who work here. Doctors and wounded, medical personnel and nurses, they live a long time in a close community in the middle of the high seas. And everything that moves the man, his hope and worry, that echoes in the sisterly heart of the nurses. Here is a letter to the bride drafted, there is a package sent to the mother, or the "youngest" duly admired. The soldiers again draw from their invincible humor. Sometimes the head nurse lifts her finger admonishingly, then quickly vanquishes her patient's exuberance. What should one do if cabin one and three are holding a real pillow fight? But when it storms outside and the Wilhelm Gustloff groans under the impact of the waves, then you move very close together, and the hunters from the Styrian land sitting next to the comrades of the coast, the various sounds whirring through the ship's hold, and everyone rummages in the memory. The images of the homeland rise, the experience of the front vanishes all again. We still hear the babble of voices on a lonely deck. We are all spun into a strange mood. 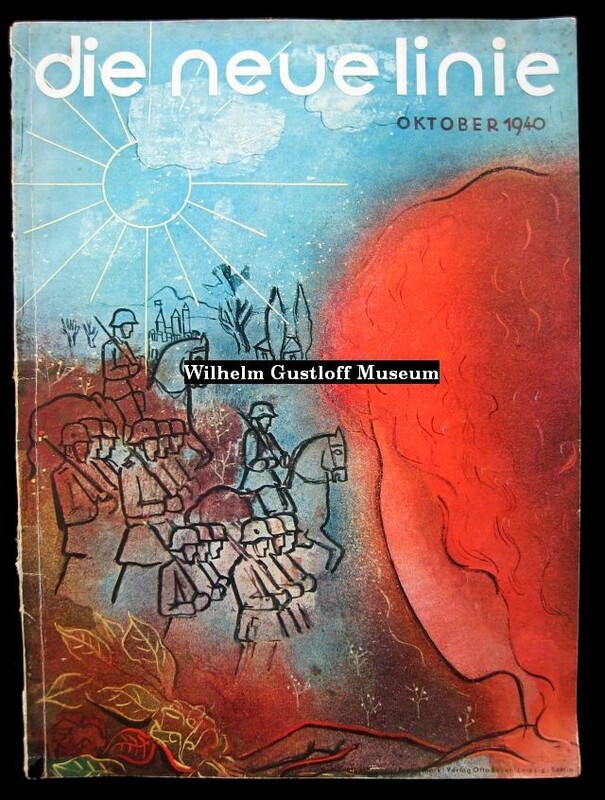 There are unforgettable impressions of Wilhelm Gustoff sailing the sick heroes into their homeland. Even in the cozy accompany of the nurses is a very special mood. They are so strongly connected to their fosterlings and hang with so much love on "their" ship, that their thinking and acting, above all, revolves around the world of the ship with its sufferings and joys. Many of them took part in the journey of the hospital ship from Norway to their homeland.